A New Year’s Eve Party? Henry and Melanie (Lutz) Adam, ca. 1910, Sioux City, Woodbury County, Iowa; digital image 2010, privately held by Melanie Frick, 2014. Happy New Year! …or at least, I think that’s what might have been said when this photograph was taken about a century ago. Featured are Henry and Melanie (Lutz) Adam of Sioux City, Woodbury County, Iowa, with Henry seated at lower right and Melanie in white above his raised hand. 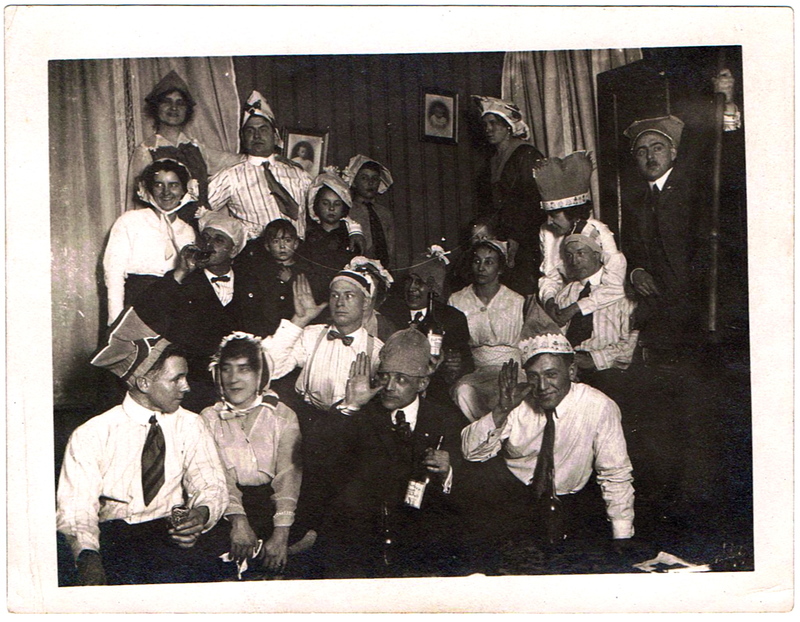 Could this photograph have been taken at a New Year’s Eve party? The curtains are drawn in the living room or parlor where the photograph was taken, which suggests to me that it could be after dark. Furthermore, it’s clear that the alcohol is flowing. One man can be seen taking a drink, while several others clutch glasses and bottles. (Alas, I can’t make out the labels.) Nearly everyone wears some sort of silly hat made of cloth or paper, and only three older children are present in the photograph – no little ones. Note that three of the men in front, including Henry, make a gesture with their thumbs to the sides of their noses and their fingers extended flat, pressed together. They aren’t quite thumbing their noses in the way that I have seen, so I wonder what this gesture might have meant. Of the nineteen people gathered here, only Henry seems to be ready for the camera. Most, including Melanie, look to the side, perhaps at another photographer, or are caught in the midst of conversation. Whether this gathering was for New Year’s Eve or not, one can easily imagine the chaotic scene as an attempt was made to corral this lively group of friends for a memorable photograph. Cheers! This entry was posted in Photograph Analysis and tagged 1910s, Adam, family history, genealogy, Iowa, Lutz, Sioux City on January 3, 2014 by Melanie Frick.